I came up with this recipe a few years back to use up some leftover black-eyed peas and it was a hit with my customers. They always got excited to see Hoppin’ John salad on my menu. Technically, it’s not really a true “hoppin’ John” because I don’t use rice, but you could toss in some wild rice and it would only add to the flavor. In the South, this salad is similar to what some people call “Redneck Caviar”. Like any good marinated salad, it can be made just prior to serving, but it’s even tastier if made a day or two ahead. The longer it “marinates” in the frig, the better it tastes. Put the frozen peas, bay leaf and salt in a pot. Cover peas with water and cook at a slow boil for 45 minutes, or until peas are tender. Drain, rinse with cold water and place peas in a large salad/mixing bowl. Add all remaining ingredients to the chilled peas, using salt and cracked pepper to taste. Cover and refrigerate until ready to serve. 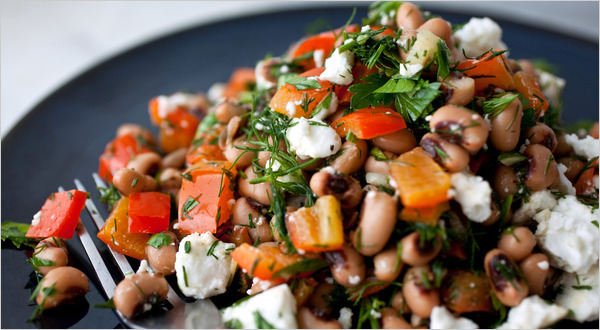 This entry was posted in Salad, Tailgating Recipes, Vegetable Side and tagged black-eyed peas, feta, hoppin john, marinated salad, pea salad, redneck caviar by quarlj01. Bookmark the permalink.